In this section of the paper, I explore the first part of the definition of sacrament given in Part 1. I try to show how the martyrs posses “visible signs of inward and spiritual grace.” Examples are taken mainly from the writings of St. Clement of Alexandria and The Martyrdom of St. Polycarp. If you have any questions please leave comments (I need practice for any questions that might be asked to me at the conference). Above, sacrament was defined as a, “Visible signs of inward and spiritual grace.” First, martyrdom is a show to the world of the grace and peace the martyr has found in his or her belief. In the case of the early Christian martyrs, it is a sign of the spiritual grace Christ has perfected in those who are about to join him. The martyr who dies well does not give up the faith at the threat of torture or death, is already perfected by Jesus. The teacher and theologian, St. Clement of Alexandria gives examples of the grace he believed the martyrs possessed. In his writings about the martyrdom of the true Gnostic, he exhorts the reader writing, “We call martyrdom perfection, not because the man comes to the end of his life as others, but because he has exhibited the perfect work of love.” He continues, “Here I find perfection apprehended variously in relation to Him who excels in every virtue. Accordingly one is perfected as pious, and as patient, and as continent, and as a worker, and as a martyr, and as a Gnostic….when the gnostic martyr has first shown the perfect work, and rightly exhibited it, and having thankfully shed his blood, has yielded up the ghost: blessed then will he be, and truly proclaimed perfect, ‘that the excellency of the power may be of God, and not of us,’ as the apostle says.” Lastly, he says, “Such being the case, the prophets are perfect in prophecy, the righteous in righteousness, and the martyrs in confession, and others in preaching, not that they are not sharers in the common virtues, but are proficient in those to which they are appointed.” The goal of the Christian is to obtain perfection both in this world and in the next. The martyr, by his or her good confession of Christ in martyrdom, receives the grace of perfection which God has called them to. The martyrs make a spectacle with their bodies and death, just as the bread and wine of the Eucharist are made a spectacle in their breaking and blessing. 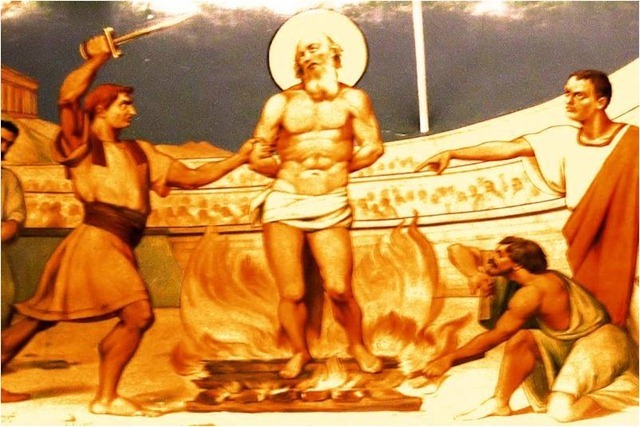 Further examples of the visible signs of grace can be seen in the Martyrdom of St. Polycarp. In this testimony about the holy martyrs who suffered along with St. Polycarp, the reader learns the source of the martyr’s perfection: “fixing their eyes on the favour of Christ, they despised the tortures of this world, in one hour buying for themselves an exemption from the eternal fire.” They show the visible sign of their grace in their endurance as they suffer for Christ’s sake. In the same account, when speaking about St. Polycarp the author writes, “…he was filled with a joyful courage; his countenance was filled with grace…” he was filled with a spiritual grace from Christ. The martyrs not only show the sign of their grace in enduring unspeakable tortures, but in outward appearance of serene composure. Clement of Alexandria, Stromateis, Book 4, 146. Martyrdom of Polycarp, 2, trans. Herbert Musurillo, The Acts of the Christian Martyrs, (Oxford: Oxford University Press, 1972), 3. This entry was posted in Uncategorized and tagged Martyrdom, NAPS, Polycarp, Sacrament. Bookmark the permalink.